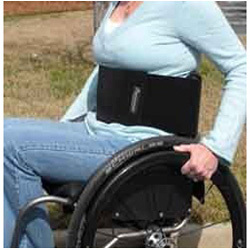 Support your upper body and add strength in every move with the Body Bracer-Abdominal Binder. You will love this awesome Body Bracer for the comfort you will experience using it whether every day or during sports activities. Improve your performance on the pitch with this bracer that will enhance your safety, performance and comfort. Keep reading to find out the wonderful features that the Body Bracer- Abdominal Binder has. The Body Bracer has a soft and secure belt for absolute support of the abdomen. It is made of neoprene; a perfect choice for the binder as it is stretchy in nature. It is stretchy and resilient, this gives you secure abdominal support every time you wear it. The Body Bracer will not inhibit any kind of movement; you can give 100% with it. The ply-able feel is excellent for track and field events and even for everyday use. Only patients without injuries on the abdomen can use it. The fact that you are confined to a wheelchair should not inhibit you from doing what you enjoy. If you love sports this is your ideal partner as you sweat it out on the pitch, and in case you need reliable support as you go about the daily tasks the Body Bracer is here at Sportaid for you. Sportaid offers you the best price in town coupled with the best customer service support you can find anywhere thanks to their fantastic customer service team.